Does the idea of having your dog “off leash” scare you a little bit? You may change your mind! Learning the right tricks, tips, and techniques can make the off leash experience a rewarding one for your dog and for you, too! Before we get to the good stuff, you may be wondering why you would want to train your dog to be off of his leash. Safety. Yes, safety. If you have a dog who has not been trained to respond to you, he can be in big danger if someone leaves the gate open and he gets out. If he doesn’t know what it means when you’re telling him to “Come!”, he probably isn’t going to come. Especially when there is a big world of cars and squirrels and people to meet, right in front of him! The health of your dog. Dogs love to run, play, and frolic! It’s good for their physical health AND their mental health. So, how do you train your dog to follow your commands and behave when he’s off his leash? Toss the leash. Okay, don’t actually TOSS it, but for your dog to learn off leash behavior, he has to be off the leash! Start off small. Begin in a safe place, like your living room. Once you feel that he is ready, move to a bigger area, like a fenced in backyard. Then, progress to a park with a fence. Make training a part of the daily play routine. Give rewards for good behavior when you and your dog are going through your normal routines. Know your dog’s limitations. Some dogs have certain things they are afraid of that will make them not be reliable in an off leash situation. For example, if you know your pooch is afraid of thunder, don’t plan an off leash activity when storms are in the forecast. Think ahead and try to anticipate where your dog may have an issue sticking with his learned behavior. Now that we have some parameters, let’s get to the nitty-gritty of the actual training! Now that we have some parameters, let’s get to the nitty-gritty of the actual training! Go to whatever area that you have chosen to begin your training. Remember, your living room or kitchen is a good choice, but definitely somewhere enclosed. Another consideration is choosing a spot that isn’t too interesting for your dog. Minimize distractions. Your dog should have their leash on, at this point. 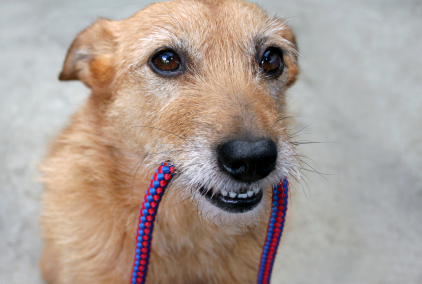 Hold onto the leash and as soon as your dog looks at you, even if it is brief, say, “Yes!” and unclip his leash. This gives your dog the first idea that paying attention to you earns him the reward of getting to explore a little. From this point on, you will always make sure your dog gives you his attention before you allow him off his leash. As your dog explores in the confined area, he will eventually make his way back to you. When he does, give him a happy, “Yes!”, a treat, and encourage him to go play. You’re rewarding him for paying attention to you! Periodically during your training time, clip your dog’s leash back on, wait for him to pay attention to you, then unclip the leash, encourage him with a “Yes!”, and tell him to go play. Once your dog starts to get a little bit bored and spending more time by your side, it is probably a good point to end the training session. As we mentioned before, after a few training sessions in one area, branch out to one with a little more space, albeit still fenced or otherwise enclosed. Keep practicing! Eventually, reward your dog with things other than treats, like toys or some fun tricks. Keep in mind that your precious pooch is never 100% safe when he is off leash. You can’t predict things that might cause him to abandon his training, like a car backfiring or a pack of squirrels! If you know your dog has an inclination to get spooked by loud noises, chase cars, or displays any other unpredictable behaviors, off leash training may not be a wise idea for him. Give off leash training a try! You may be pleasantly surprised by what you can train your four-legged friend to do when you use the right techniques! Want to learn more about off leash training for your dog or hundreds of other dog training tips?